Mercedes-Benz DIGITAL LIGHT is the luxury car brand’s new dazzle-free main beam headlamps. These HD-quality headlamps improve visibility and brightness, but they also have communication and driver assistance abilities! Learn more about this exciting technology for new Mercedes-Benz vehicles below. Each new Mercedes-Benz DIGITAL LIGHT headlamp utilizes over one million micromirrors, which means there are more than two million micromirrors per vehicle! The intelligent control logic created by Mercedes-Benz uses specific algorithms that receive information about the vehicle’s surroundings. After computing this information, the technology calculates the brightness value for each pixel in real time. In other words, the headlamps adapt their light distribution based on the surroundings to optimize visibility for the driver. They do this without creating glare for other drivers on the road. When driving at night, the ability to distinguish between lanes or recognize traffic signs becomes more difficult. DIGITAL LIGHT can make driving easier and safer by projecting navigation guides, such as a direction arrow to indicate a curving road or missing road markings. Additionally, these new Mercedes-Benz headlights can project traffic warnings or road condition symbols when a driver might otherwise have difficulty seeing them. While this is impressive, that’s not all there is to DIGITAL LIGHT; this headlamp technology will also have the ability to communicate with other cars in the not-so-distant future! Contact us to learn more about DIGITAL LIGHT or other Mercedes-Benz technologies like mbrace®. You can also visit us at Fletcher Jones Motorcars near Laguna Beach and Costa Mesa to browse our inventory of new Mercedes-Benz vehicles and enjoy a demonstration of some of these Mercedes-Benz technological features in person! 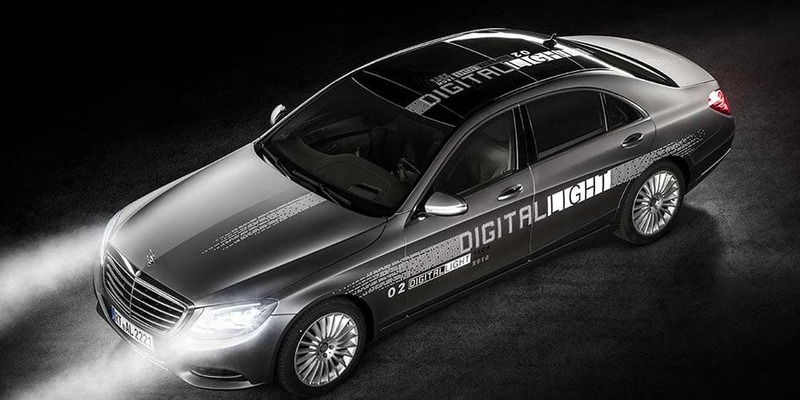 0 comment(s) so far on What is Mercedes-Benz DIGITAL LIGHT Headlight Technology?